When another friendly creature attacks, Helgen Squad Leader gains +1/+0. 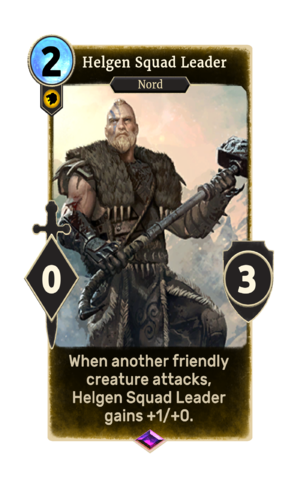 Helgen Squad Leader is an epic Willpower creature card. It is part of the Core Set. This card's ability applies the Squad Tactics card effect. The card is named for the Skyrim town of Helgen. Despite the card being named for Helgen, a township in Falkreath Hold, the depicted armor bears the insignia of Hjaalmarch Hold. This page was last modified on 15 February 2019, at 12:02.